Okay, it had to happen if I'm to be fair. There are some things I wish UVa would change or get more. No place can be perfect, and it's important to evaluate what a school does and does not have so that you can have all the cards in front of you before diving into a decision. Everyone in Charlottesville says it. We need more parking. Driving is not worth it most of the time. In all fairness, as I said yesterday the buses and trolleys are free. Moreover, most things are in walking distance. I know one of my fears was that my mom wouldn't have a place to park if she visited me, but a lot of permit-only parking becomes free space for the weekend (thank you!). The catch is that you might have to park at Scott Stadium or University Hall. Neither are terribly far away, but they're not next door, either. Also, things farther away from the heart of Grounds (i.e., where you'll need a car the most) tend to have more parking space anyway, so when you need to drive, you're able. I've always found it a touch annoying that student organizations and even Housing espouse "Don't sign it" campaigns. The goal is to stop the housing cycle. That is, students sign up for off-Grounds housing in October because they fear there won't be houses left. It's a huge pressure and stress, and I get that. My problem is that Housing requires a yes/ no and where and who are you living with next year by early December. It's very annoying that they do that and want people not to make a decision about off-Grounds housing in the Fall. Students feel like they have to or they risk misunderstanding what their friends are doing. No one wants to end up the only member of the group in on-Grounds housing or the only one off-Grounds. It's a sticky situation. Fortunately, even though the deadline sounds soon--and to some extent, it is quite early--the system usually works without much problem. I've tried going in with a preselected roommate, and I've taken potluck, and it works out well regardless. What I'm trying to get across is that even though the deadline is in December, it's not a big deal. I wish it could be later, but I know that Housing has a lot of work to do, and they want to get it done sooner than right before it's absolutely necessary. This paragraph is definitely a nod to Engineers and Architects. Lately, in an effort to keep tuition lower, UVa has trimmed down on some of its computer labs, and I really, really wish it wouldn't. Yes, there are still computer labs, but my concern is that when there were more labs, you could still be waiting to get a desktop. Students in the College of Arts and Sciences probably won't use the school computers much because they're rarely in a class that requires special equipment (let's face it--you don't need a super computer to operate a word document); however, as I said before, the Engineers and Architects may find themselves slightly more inconvenienced by this new change. A lot of these programs need some power behind them, and little laptops can't handle it, forcing them into a lab. On the bright side, everything listed above is just for added convenience; there isn't something seriously, seriously wrong. Sure, it would make life much easier if the University just gave everyone a computer, then no one would have to go to a lab, but that's just not realistic, rational thinking. Look at what a school does or doesn't have and decide whether it really is a con for you. Maybe you love to drive and so the idea of limited parking is catastrophic for you. Maybe you get carsick and would rather walk anyway, so you don't care if there's any parking at all. It's completely up to you. You choose what's important to you. And remember: relax. Shopping around for schools can be really fun if you let it. *Also a special note of thanks to Steve Norum for his picture of dorms. Thank you, thank you! If there's one thing that most helps people give better advice, it's having perspective. 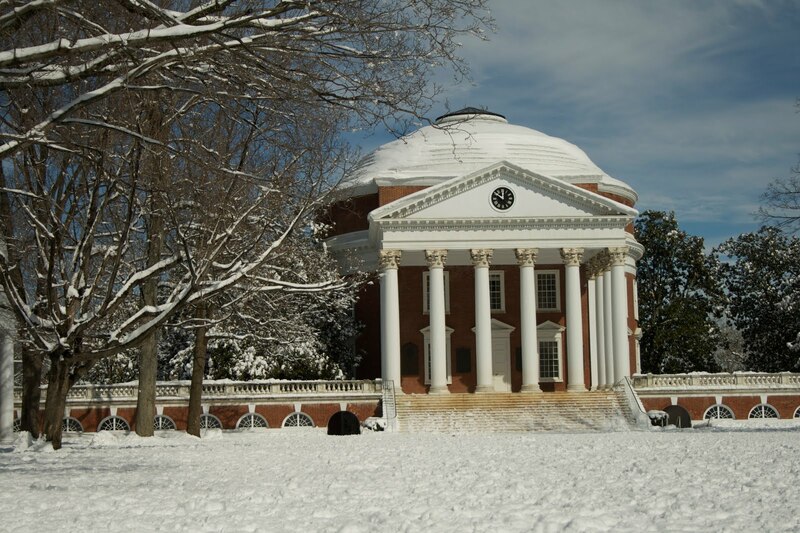 As a student who has gone to one school for undergraduate, I really wasn't certain what was standard and what was UVa-specific. Sure, I know the things that I love and appreciate on Grounds, but I still wouldn't say that I know what is mostly common; however, as I'm doing research at another institution this summer, I'm getting a very good view of some key differences from talking with students at the other college. These discussions in mind, I want to discuss a few things that I had simply taken for granted. I did not come to college as an avid sports fan, but two years in and I regularly attend football, basketball, and lacrosse. The atmosphere is quite exhilarating. The band chants and cheers, the crowd gasps and cheers in synch. It's just a fun pastime that I hadn't expected to be as fun as it is. Moreover, because the matches are free, the only limiting factor is time; no one has to go get a part time job just to get to see the games. I was shocked when I was at my current summer school and the bus driver asked for money. Wait, people pay for buses and trolleys? Whoa. I should've guessed that, I suppose; that's how it works in non college towns, but I just didn't expect it. UVa has spoiled me. I've never shown a bus pass or id before because no one pays for rides. Technology has this unfortunate quality that the chances that it will break are directly proportional to how badly you need it (i.e., it breaks at the worst times possible). To Incoming First Years, a note: we have fantastic libraries; use them. So here's my plan for this week: each day there will be a new post in a mini series about things I've learned while studying at another school. While I do not plan to name the school I'm at currently, I do want to assure people that it is a fantastic institution and one I'm highly considering for graduate school. My comparison of the two schools is in no way intended to vilify or promote one or the other; I simply want to record differences and occasional commentary. The nature of my visit is quite simple: I joined an extraordinary research lab group and have been using a host of molecular techniques to study viruses. Frankly, I've fallen in love with the lab. The people are not only extremely bright, thought provoking, and helpful, but they're also very welcoming and easy to get along with. For anyone considering graduate school, certainly I would recommend REUs (Research Experience for Undergraduates). You get an open view of what life would be like at your host school. You also get a fairly good idea of whether or not you'd like the field you're working in eight or nine hours a day. Even though the program isn't over, I can safely say that this experience will be one of my favorites for all of college. Even the lovely snow can't compare to the fun I'm having where I am. What to do after graduation? Reminisce, of course! It's that time after graduation when you have nothing to do but apply to jobs and reminisce about a time when everything was planned out for you in advance. I always knew I would be going to college, taking a year off was not even an option (I did not even know people did that until senior year in high school). And so, my four years at U.Va. are finished. No more classes, no more homework, no more tests, no more easy decisions. Now I have to find a way to support myself, figure out the future, find my own niche in the world, discover something new, and everything else that goes with "growing up." As a way to remember my years at this wonderful University, here are a couple of questions I answered just to make it easier to understand. Enjoy! Why did you even look at U.Va. and what drew you to the school? I found a picture of the Lawn and the Rotunda in 10th grade and fell in love. What was the first-year experience like? During my first semester I took 13 credits, studied and didn’t really do much else. I didn’t even meet that many new people. My second semester I signed up for 15 credits, joined Theta Nu Xi Multicultural Sorority, Incorporated, and transferred from a Commerce direction to the School of Architecture to major in Urban and Environmental Planning. It took a while to get to know the Grounds and feel comfortable with the place but after a rocky first year I had no troubles at all. What one activity has been the most meaningful and why? Two activities: my sorority and Residence Life. In my sorority, I met a great group of women and learned more about myself than I could have in any other club or organization. As the only multicultural sorority on Grounds the women who join are dedicated to diversity and are leaders in everything that they do. As a Resident Advisor, I met people with interested quite different from my own, learned to interact with them, and create an amazing living environment. These two activities influenced my University years so much that I sometimes wonder what my life here would have been like if I hadn’t joined one (or either). What is your favorite memory from your time at Virginia? On the day of Foxfield, my third year, a couple of my friends and I decided to do nothing (i.e. lie on the lawn the entire day and do absolutely nothing) and it was everything we thought it could be. Yes, that’s an “Office Space” reference. I am looking for a job that might help me figure out what I want to do in life. Looking for a job is not easy but all you need is determination and patience. And as my dad always says: things will work out somehow and there's no need for worry as long as you put in the effort. Sum up your U.Va. experience in one word. If I had to give advice to future students, it would be this: take advantage of the opportunities you have at the University. Seriously, you will never again have the same options. Meet new people, try new hobbies/activities, go out and explore the area. And don't let the future hold you back because you are only young once. Good luck! Go forth and discover!